Switzerland has temporarily banned the sale of Volkswagen (VW) diesel-engine models which could have devices capable of tricking emission tests. It said the move could affect 180,000 cars - not yet sold or registered - in the Euro5 emission category. This comes after VW, the biggest carmaker in the world, admitted cheating on emissions tests in the US. Meanwhile, Matthias Mueller has been named new VW chief executive in the wake of the scandal. Mr Mueller, the former head of Porsche, succeeds Martin Winterkorn, who resigned on Wednesday. The US Department of Justice (DoJ) told the BBC that it would join the US Environmental Protection Agency's (EPA) investigation into VW. The ban was announced by the Swiss Federal Roads office on Friday. In a statement, it said vehicles that have 1.2-litre 1.6-litre and 2.0-litre diesel engines of VW models - including VW's Audi, Seat and Skoda brands - could be affected. A spokesman for the British department for transport said there were no plans for ban in the UK. After his appointment, Mr Mueller said restoring the company's reputation was his top priority. "My most urgent task is to win back trust for the Volkswagen Group - by leaving no stone unturned and with maximum transparency, as well as drawing the right conclusions from the current situation." He said he would tighten up procedures at the company: "At no point was the safety of our customers in danger. We will now have even stricter compliance. Our objective is that the people continue to use and drive our vehicles with confidence and pleasure. That's 80 million people driving our cars worldwide." The EPA's findings of the scandal cover 482,000 cars in the US only, including the VW-manufactured Audi A3, and the VW brands Jetta, Beetle, Golf and Passat. Media captionMatthias Mueller: "We will have even stricter governance, compliance and standards, and I will vouch for that"
But VW has admitted that about 11 million cars worldwide are fitted with the so-called "defeat device" - 2.8 million of them in Germany - and further costly recalls and refits are possible. 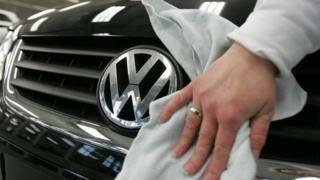 Half of the company's sales in Europe - VW's biggest market - are for diesel cars. Transport authorities in several countries - including the UK and Germany - have announced their own investigations.